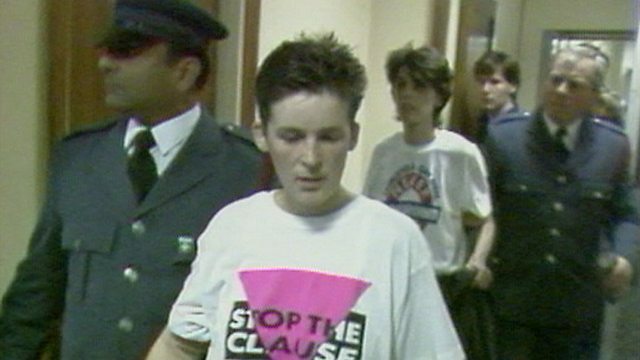 On 23 May 1988 a group of lesbian activists invaded a BBC TV news studio as it went live on air. They were protesting against the introduction of new UK laws against LGBT rights. On 23 May 1988 a group of lesbian activists invaded a BBC TV news studio as it went live on air. They were protesting against the introduction of new UK laws to limit LGBT rights. Booan Temple was one of the women who took part in the demonstration and she's been speaking to Ruth Evans about what happened that day. Photo: Booan and another protester are led out of the BBC by security guards. Credit: BBC.